We weren’t kidding. This year is the year we OWN our backyard. 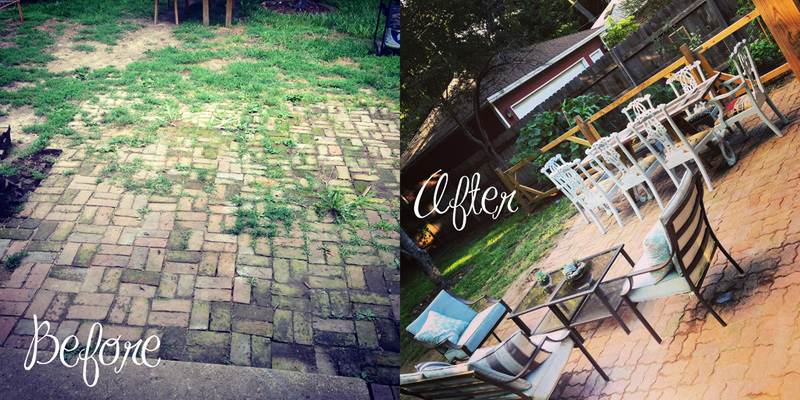 Case in point, we managed to turn our sad, sad mishmash of bricks that attempted to pass as a patio into a legit, excavated, draining, 1920s pavers-filled patio in two days. No, not a lick of patio experience. . .but thanks to the power of google, the hundreds of DIY blogs, articles and youtube videos, we felt brave enough to give it a go. 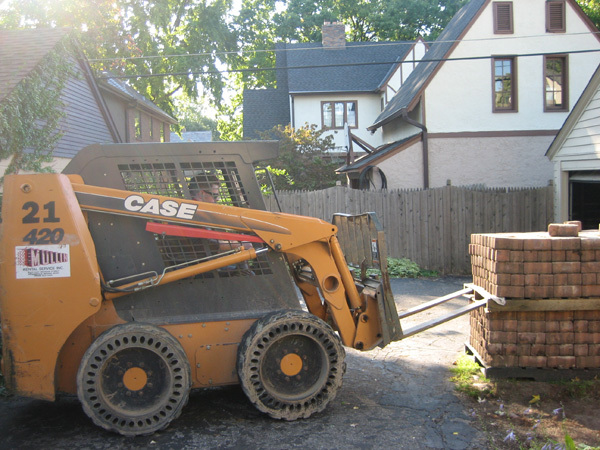 My boss happens to live in another 1920s home in the city and was having her patio and walk ways redone – out with the old brick and in with some form of concrete. 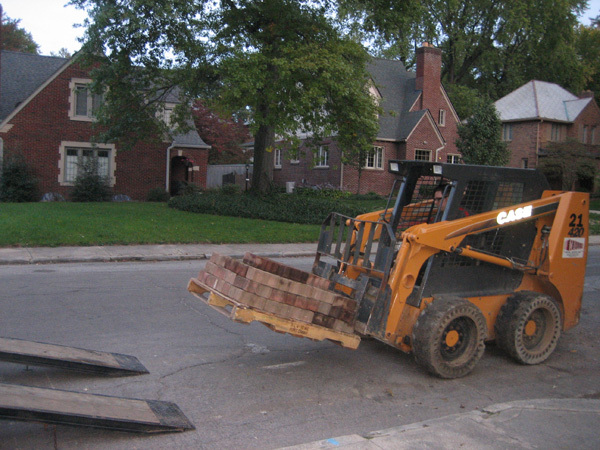 I asked what she was doing with the bricks and her response was something on the order of, “the contractor will probably just toss them.” This horrified the husband. 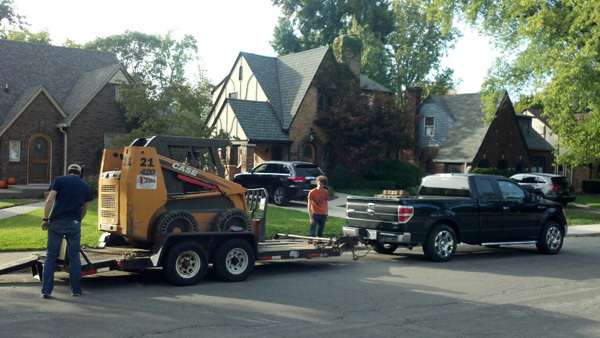 Next thing I know, we’re renting a bobcat with a fork extension, a trailer, gathering trucks and bribing friends. The following is a series of photos that will explain how the brave (questionably-sane) DIY-ers and their supportive (enabling) friends managed this endeavor. 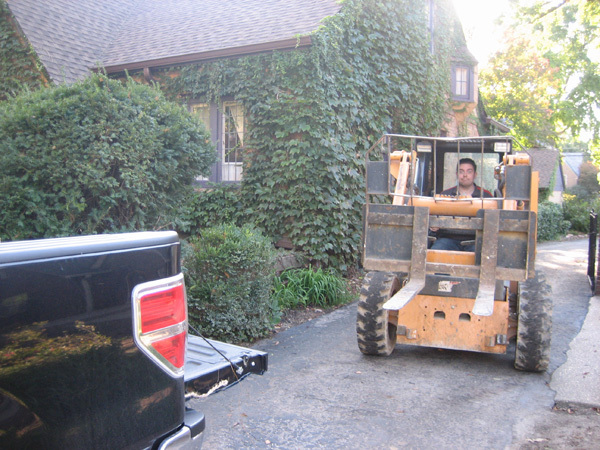 This is the face of a man who’s attempting to drive a bobcat for the first time, aim to pick up a pallet of bricks and gingerly stick it in a truck, again, all for the first time, while not damaging any of his wife’s boss’s property. . . no pressure. 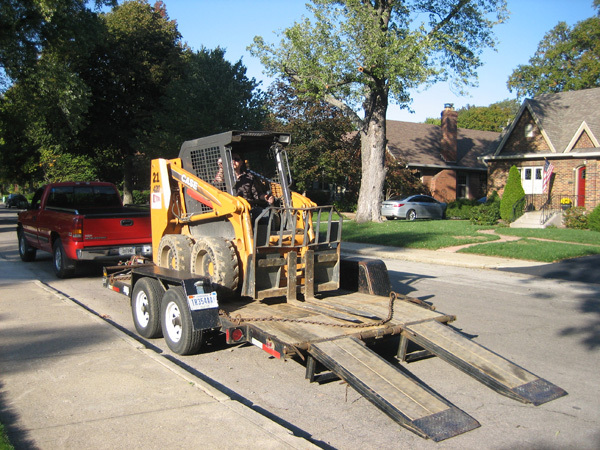 After loading a pallet, we’d have to load up the bobcat and haul it the two miles to our house, where we first tried parking trailer truck on a side street, unloading the bobcat and driving it half a block to our home and up the driveway, followed by the brick truck. 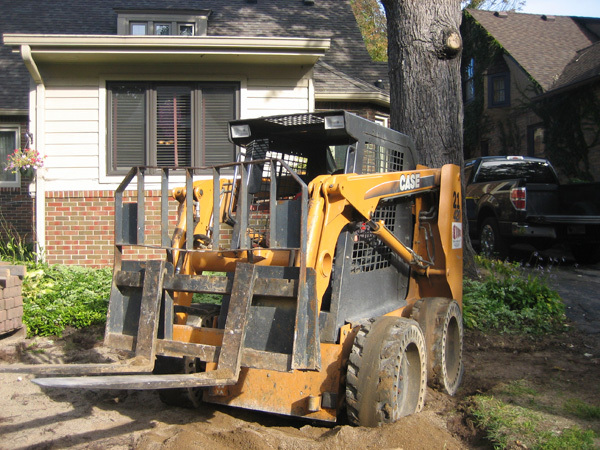 Once unloaded, we’d drive the bobcat back down the street and back onto the trailer on the side street, followed by the brick-free truck. 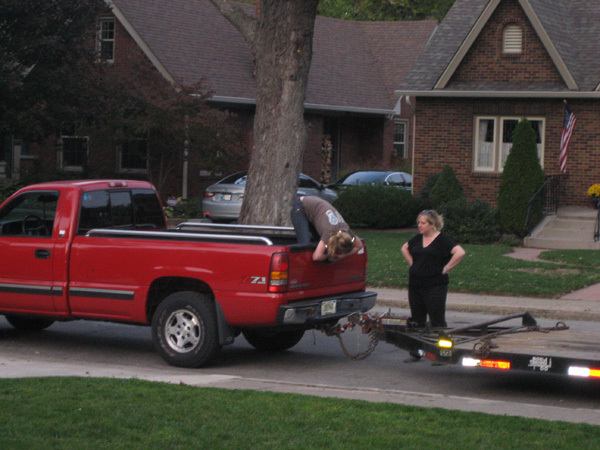 We got smarter and learned to maneuver everything in our driveway on day two. 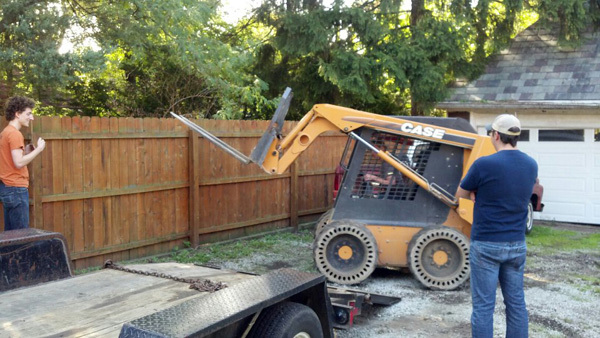 All was going smoothly – as smoothly as realizing that load of “three pallets” is turning out to be more like six pallets, can go. 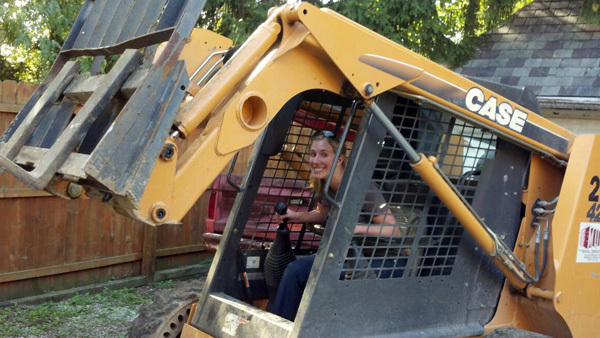 That is, until the bobcat got stuck in a sand pit. Thank goodness for Steven’s love of MythBusters. We were able to pop out of the sand without mashing up too much land in the middle. This is the face of someone being flung from a sand pit by forks and boards. 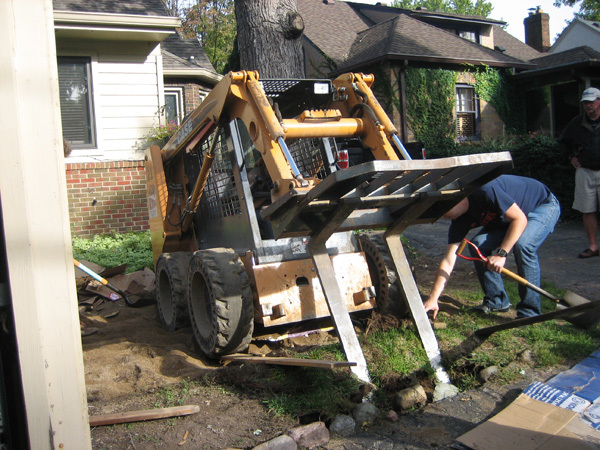 . .
More trucks and smarter loading (load both trucks with bricks, and the bobcat with bricks on the trailer). 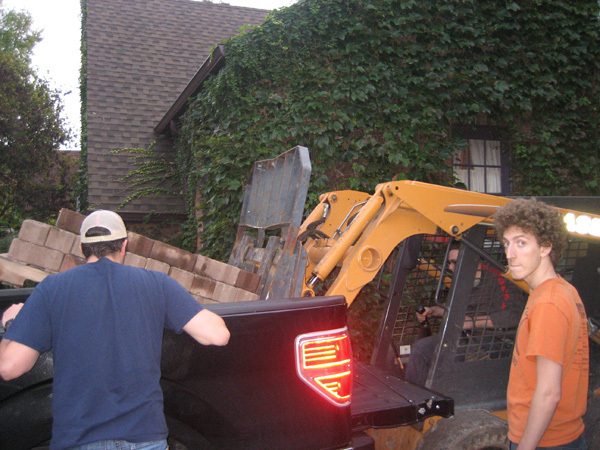 After working long into a weekend night, stacking bricks, hauling bricks, re-stacking bricks, nearly tipping over a bobcat, nearly missing the trailer’s ramps with the bobcat, a lot of sweat, and some grumpy interactions, we called it a successful move and took our hearty friends and brother out to dinner. 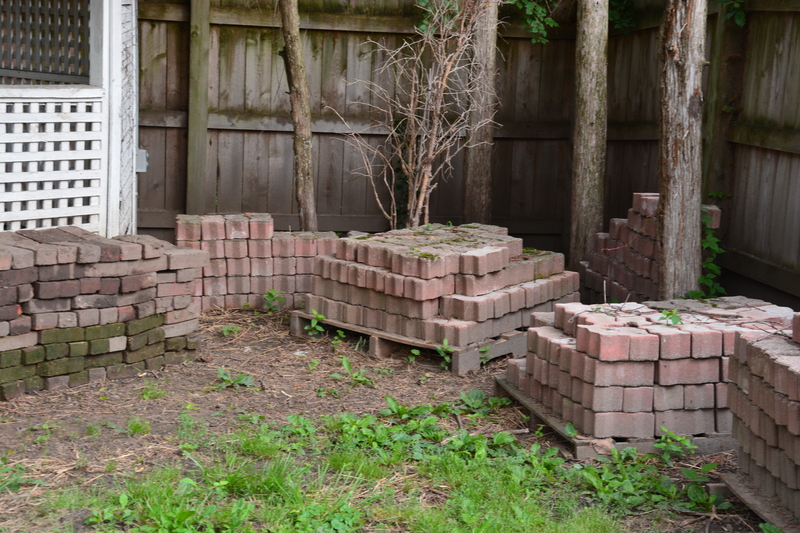 The bricks remained in our backyard for the next nine months. 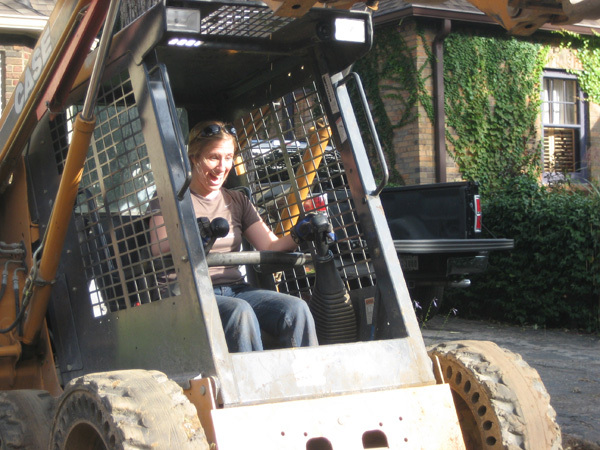 *Thanks to the boss for acting as photographer while we roamed her property with large equipment. Looks AMAZING! 🙂 I want to come over for a BBQ! Thank you!!! You SHOULD come over for a BBQ ;o) Or at least a cold beverage.